The great thing about McDonald’s stock is that it kind of retains core defensive qualities whilst technically coming under cyclicals (at least in my stock screener anyway). Take the financial crisis years for example. If you pull up the fundamental data from those years you’ll see that McDonald’s earned $2.91, $3.67 and $3.98 per-share for 2007, 2008 and 2009 respectively. Same deal for revenue, cash flow and dividends. They all rose in each year of the crisis like clockwork. I imagine the psychological support that provides as an investor is absolutely huge in a time where the world is being turned upside down. If you had your entire net worth in a portfolio comprised solely of McDonald’s stock then it would almost be like the financial crisis and ensuing recession never even happened. The business barely noticed it as sales, earnings and dividends went up. Indeed you probably would’ve piled more cash in as the market afforded you a once-in-a-generation opportunity to purchase cheap shares. Actually that’s not strictly speaking true as you were also granted a great opportunity in 2003 to set yourself up for fantastic long-term returns from McDonald’s stock. Even if you didn’t take advantage the company would have boosted your ownership stake as they retired 10% of the float between 2007 and 2010 at cheap valuations. The other thing to like about McDonald’s stock is the obscene profitably of the underlying business due a combination of the power of the brand, scale advantages and the franchise model. In fact I don’t think you ever really need to look any further than Mcdonald’s in its sector precisely because you aren’t going to find a superior business. The closest you’re going to get is something like Yum! Brands which owns KFC, Pizza Hut and Taco Bell. When I first started looking at stocks Burger King was still a stand-alone listed company and it always amazed me how much more profitable McDonald’s was despite having very similar operations on a superficial level. What I mean by that is that if you were to just compare product quality then you can’t explain it. I like a Burger King meal just as much as a McDonald’s meal in terms of the food, yet the brand, marketing and real estate put it into another league. Compare the prime locations of McDonald’s outlets to other fast food chains for example. Compare the level of marketing and the brand value as well. It’s the undisputed number one in its sector, raking in 30% returns on tangible capital each and every year on average. The above point is the absolute key to understanding McDonald’s stock and why it checks every box that makes it suitable for long-term buy-and-holding investing. The reason is that it’s not really a restaurant stock in any traditional sense of the business model. Compare it to a basket of peers and you’ll see that their margins and returns on capital are way, way ahead of any competitors. 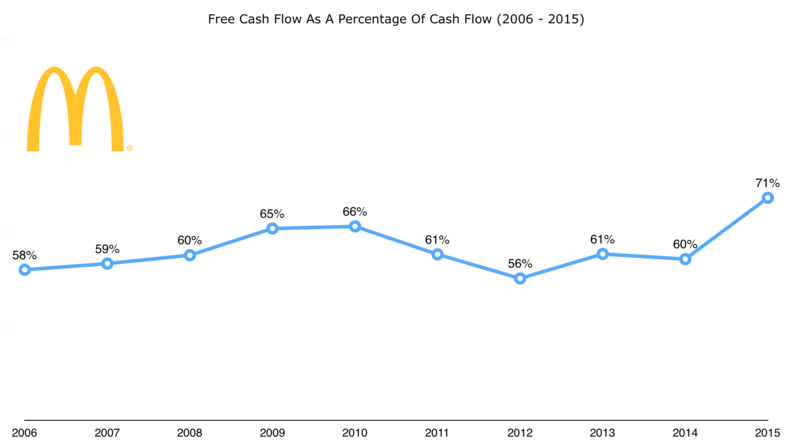 Over the last fifteen years for example they’ve pulled in average net profit margins of 17.5% whilst converting 60%+ of cash flow into free cash flow. They post 30% operating margins on average every year, which is an almost absurd level of profitability for the restaurant business. It’s in the Coca-Cola realm of basically leveraging a brand and collecting a toll: an operation that is inherently capital light. For McDonald’s that comes from the lucrative nature of the franchise model. The more attractive the brand, the bigger incentive for franchise operators to open a store. Currently the company have somewhere between 80-85% of outlets operated under franchise, essentially collecting streams of income at higher than normal margins through the attraction of their brand to business owners. You’ve also got the scale advantages that allow them to compete with anybody on price (in what is a very competitive sector). I’d also happily wager that won’t change, despite what anybody says about millennials and healthy eating. Speaking of which it’s almost unreal how overblown that point gets. Every other comment on Seeking Alpha presents it as an existential threat to their business, yet oddly enough every time I walk past those famous golden arches the restaurants are doing great trade. The good news is that every now again when those issues do flare up you get nice entry points: 2003 being a good example. Should You Buy McDonald’s Stock Right Now? If only life were as easy as hindsight investing though! Let’s look at McDonald’s stock in the here and now at $115 per-share. First of all that share price puts the stock at roughly 20.7x expected 2016 earnings. In addition you get a $3.61 dividend this year to go with it (roughly a 3.15% yield in other words). Since the turn of the century the only other year when you were looking at a higher average P/E ratio than that was 2000, and indeed the returns from then were exceptionally poor in the short run. If you’re thinking about buying McDonald’s stock today then it means accepting dollar cost averaging and/or being prepared to commit more funds when the value multiple inevitably comes down. It could also mean accepting years where the share price goes sideways. The way you should approach it is that as a business you’re talking one of the top few dozen in the world. As long as the stock doesn’t go for some insane Coca-Cola-in-1998 type valuation then there’s probably never a really bad time to invest in such a high quality business. Even in the situation back in 1999, where investors were paying 30x earnings and only collecting a 0.5% dividend yield, the underlying earnings growth was sufficiently good to provide decent medium-term returns despite the contracting value multiple. Right now the forward growth expectations might not be as high as back then, but from a base of 20x earnings with a 3.4% yield covered healthily by free cash flow you’re in the camp where it will probably still be pretty good provided you’re prepared to stick it out over the long-term.